We are just back from a lovely family excursion to Chicago. Trains, subways, boats, cars, and a whole lot of walking have brought us back home. I am pooped from an exciting three days. I was so proud of myself for having Monday and Tuesday posts ready to go while I was away, and now I return home to a whole lot of laundry and dishes so I'm going to do something I rarely do. Have you heard about this one? I heard about it from Melanie, and then I followed over to Susannah Conway's blog. Feel welcome to check and see what it's all about and copy yourself a badge because Katrina made some nice options! 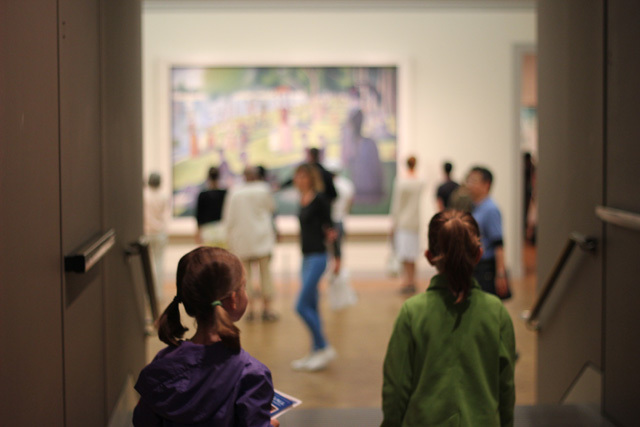 We spent 3 hours (without drinks or snacks) soaking up the entire Art Institute of Chicago. This is one of my favorite photos. That's a smile you see appearing on the right cheek of my daughter, C. The kiddos loved experiencing the size and detail of the artwork.